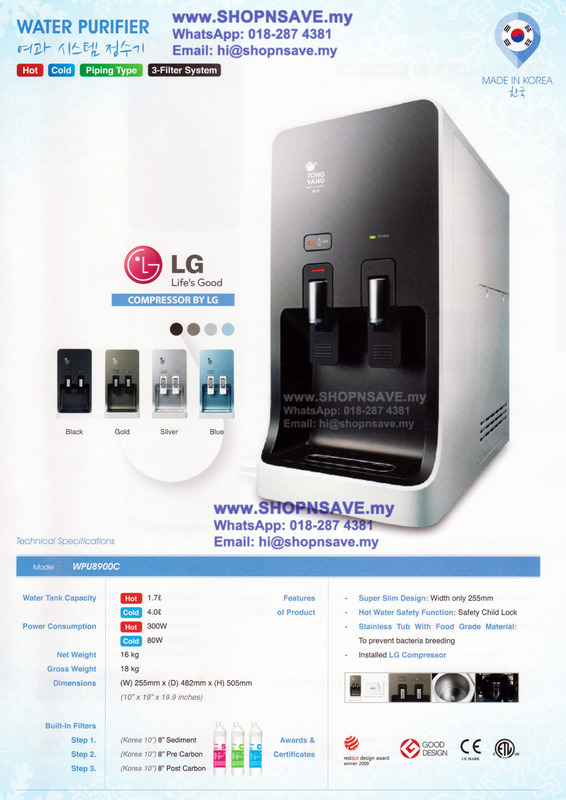 Tong Yang 8900c Hot Cold Water Dispenser Water Purifier — SHOP N' SAVE [优质生活] quality living & effortless shopping! COD available Call/ Whatsapp @ +6018 287 4381 for sale inquiry. Ultra Filtration System >> Bacteria free, ultra filtration 0.05 ~ 0.3 micro pore size. Pi Energy Alkaline System. >> Smaller cluster of water & rich of antioxidant, enhance water alkalinity. Alkaline Water System >> Strong alkalinity pH, up to 8.5 ~ 9 & rich of antioxidant & minerals. Super Slim & modern design. COUNTER TOP & DIRECT PIPING. Safety child lock for Hot Water. After sale service & support is available.